I LOVE weekends for oh sooo many reasons! One of those reasons being that I have a little more time to make breakfast! The hubby and I love to have pancakes on the weekends! These ones are flourless and turned out so flavorful and delicious! Blend all of the ingredients in a food processor/blender EXCEPT the blueberries until smooth. On a griddle or pan sprayed with non-stick spray on low/medium heat place about ¼ a cup of batter on the pan per pancake. Place approximately 5 blueberries on each pancake one on the pan. Allow it to cook until the bottom side is cooked and the top starts to bubble then flip and cook the other side. Don't have blueberries? 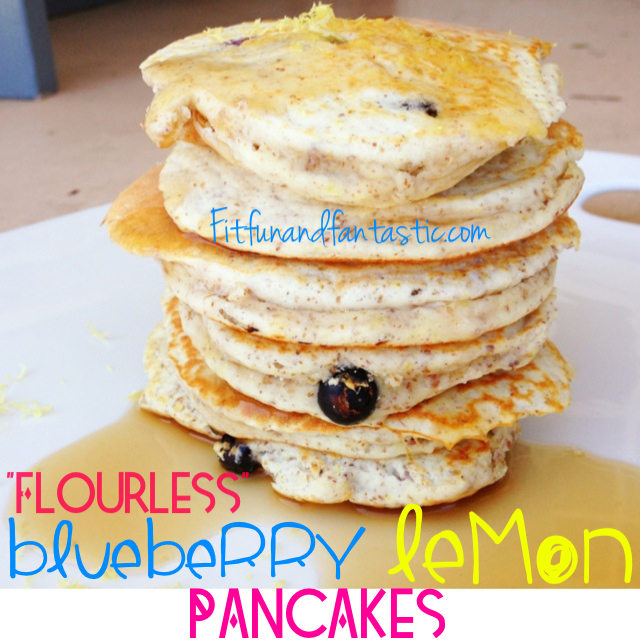 These are great as just lemon pancakes too! 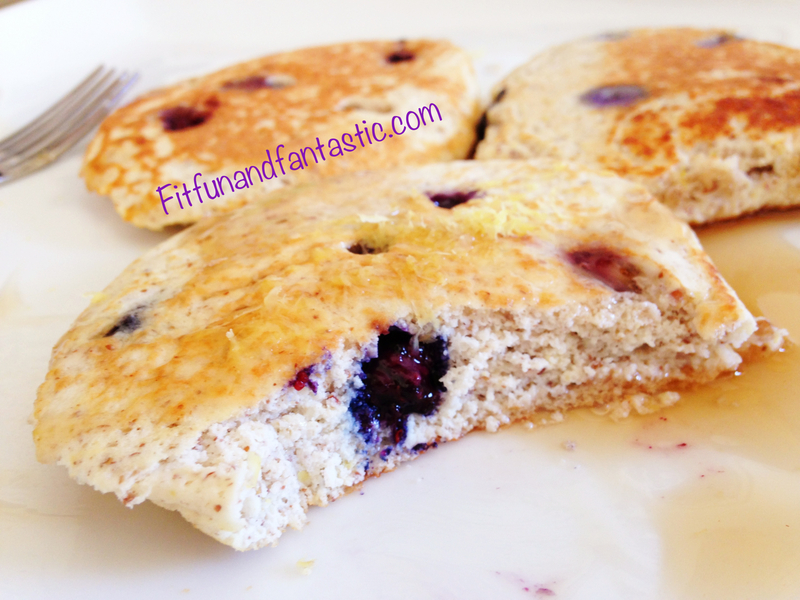 19 Responses to "“Flourless” Blueberry Lemon Pancakes"
Is that 1 1/4 cups of liquid egg whites? Is it 1 1/4 cups egg whites or 1 1/4 egg whites (like equivalent to eggs)? This looks great! I love that it is so high in protein too. So it’s 1 AND 1/4 cup egg whites? Or just 1/4 cup? Can you use the code more than once for the protein? Do you happen to know egg whites that would be? I’m all out of liquid egg whites! I think approximately 8 egg whites. Awesome recipe! I just found your blog through a reader and love it:) Great recipe- I just LOVE About Time- have you tried their new whey out yet? It’s a limited flavor:) Chocolate Coconut! So glad you found me! I haven’t tried it yet, but I can’t wait! Chocolate and coconut are 2 of my faves so I can’t see how it wouldn’t be amazing! Feel free to use my 25% off code: fantasticallyfit to save on any order.